Keith Hernandez was a World Series hero, the best-fielding first baseman in the sport, the most consistent hitter in the Cardinals’ lineup, winner of a league Most Valuable Player Award and a fan favorite. To Whitey Herzog, none of that made up for what the Cardinals manager considered an unforgivable sin _ lack of maximum effort. In a trade that remains one of the most unpopular and contentious in franchise history, Hernandez was dealt to the Mets on June 15, 1983, for pitchers Neil Allen and Rick Ownbey. _ Impending free agency. Hernandez was eligible to become a free agent after the 1983 season and Cardinals officials expressed doubt they could sign him. The primary reason, though, was the deteriorating relationship between Herzog and Hernandez. “Keith Hernandez was dogging it … He’s the best defensive first baseman I’ve ever seen. But on offense, he was loafing. He loafed down the line on ground balls and he wasn’t aggressive on the bases. The deal of Hernandez to the Mets was announced at 7 p.m., an hour before the trade deadline. Hernandez was taking batting practice at Busch Stadium when he was called into Herzog’s office and informed of the trade 20 minutes before it was announced, the Associated Press reported. When the deal was announced on the Busch Stadium scoreboard, fans booed. 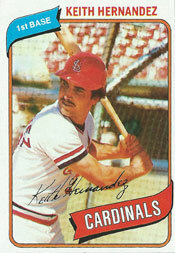 Eight months earlier, Hernandez had produced seven hits and eight RBI in the last three games of the 1982 World Series. He sparked a Cardinals comeback in the decisive Game 7, driving in the tying run with a two-run single. He hit .299 in 10 years with St. Louis, won the 1979 National League batting title and shared the Most Valuable Player Award that year (with the Pirates’ Willie Stargell) and won five consecutive Gold Glove awards from 1978-82. In exchange, the Cardinals got Allen (2-7, 4.50 ERA) and Ownbey (1-3, 4.67). Allen had told the Mets he thought he had an alcohol problem. Instead, he was diagnosed as suffering from stress and was undergoing therapy at a New York hospital. Turns out there was more of a problem than most knew. Hernandez testified that he broke his cocaine habit on his own just before the trade to the Mets. Hernandez said what motivated him to stop using was seeing Cardinals teammate Lonnie Smith have a “bad experience” with the drug after a game at Philadelphia. Herzog said he didn’t know Hernandez had been using drugs, but that he had become suspicious. Hernandez would thrive with the Mets. At the time of the trade, the Mets had the worst record in the major leagues. Hernandez helped transform them into contenders by 1984 and then World Series champions in 1986. Allen was 20-16 with five saves in three seasons with St. Louis. Ownbey was 1-6 in two Cardinals seasons. Too bad the deal with the Astros didn’t go through. At least the Cards would have gotten something for Hernandez. Allen was washed up and Ownbey was not very good. I wish they had sent Keith and Oberkfell to KC for George Brett as had been rumored before. I don’t care what Whitey says. This was an atrocious deal for the Cardinals. Truly a “panic” move by the Cardinals that continues to sully Herzog’s reputation as a baseball genius. The Mets accepted this gift and it transformed them in a perennial power – IN THE SAME DIVISION AS THE CARDINALS. GOOD GOD. To bad that Whitey and Kieth couldn’t work things out. But then again, with the cocaine scandal on the horizon, maybe the only solution was a trade. It would be foolish to think that Whitey was clueless about the drug use that there was in clubhouse. In fact, back in the 90’s, I remember reading an interview by Whitey in which he and some of the coaching staff discovered that the players were getting that “white powder” up in Montreal. Upon this discovery, Whitey decided that everytime they had a series with the Expo’s up north, he would purposely arrive in Montreal as late as possible even if it meant that they’d barely have time to take a little BP. This is just my opinion, but the fact that the trade was terribly lop-sided and the fact that the team they traded him to was one of the worst teams at the time, just proves that there’s a lot more to this story that we still don’t know.